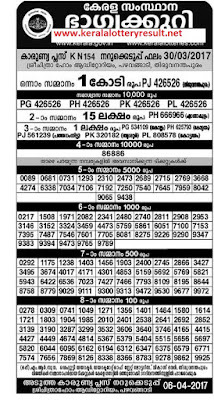 Live KARUNYA PLUS (KN-154) RESULTS : Welcome to www.keralalotteryresult.net Today's, Today Kerala lottery result is Live KARUNYA PLUS (KN-154). Weekly lottery draw conducted by Kerala lottery department at Sree Chithra Home Auditorium by Kerala Lottery Department and the result will be published in the official websites of Kerala Lottery Department, www.keralalotteres.com and www.kerala.gov.in by 03:00 PM. 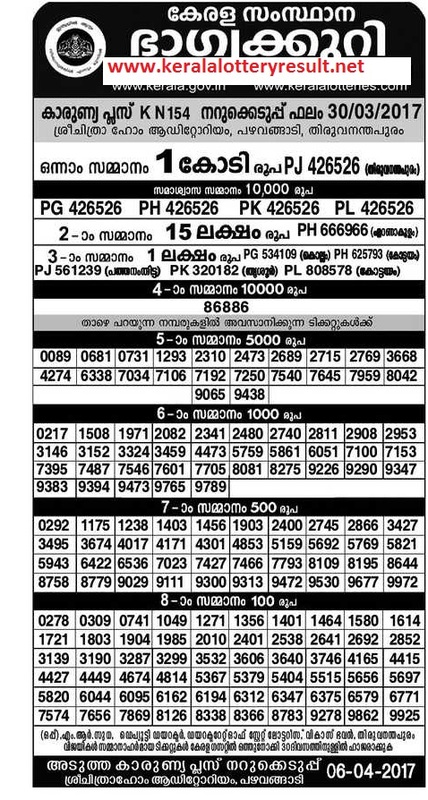 You can view this KARUNYA PLUS (KN-154) Lottery results today live here today as early as it is possible. Refresh this Live KARUNYA PLUS Lottery (KN-154) Results 30-3-2017 for new winning numbers of KARUNYA PLUS (KN-154) The will compress the style files for your websites in seconds.